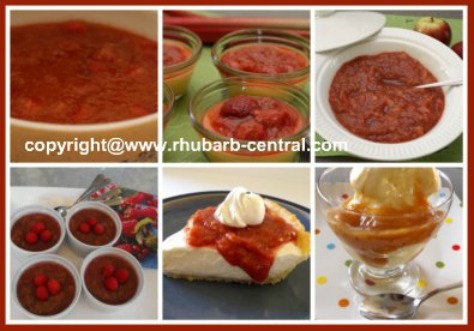 Rhubarb Sauce Recipes take only little time and effort to make, and the results are certainly well worth the effort! 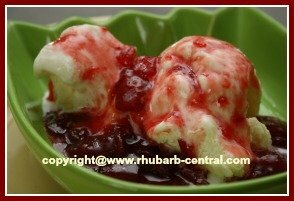 Homemade sauces and syrups or compotes made with rhubarb make a delectable topping for ice cream, yogurt, pudding, pancakes and more! If you are interested in making sauce with this very versatile vegetable, we have you covered! Although "sauce" is sometimes referred to as "syrup", or "compote", they are really one and the same thing. So delicious and versatile, this sauce is very convenient to have on hand. You can even use these recipes for sauce as desserts - just the way they are. Served in a small dessert bowl, or glass, they make a healthy and light dessert! Or, make a yogurt rhubarb parfait! I have also included a few meat sauce recipes to make with rhubarb. Most of the sauce recipes listed below, will keep in the refrigerator for up to, a week, so if you have left overs, you can use it again by serving it with another dish! Sometimes, instead of making an actual sauce with rhubarb, I like to make rhubarb jam with a spreadable consistency and texture, and use this delectable jam as a topping for ice cream, sorbet, yogurt, Greek yogurt, and sour cream, in addition to using it as a topping for bagels, toast and pancakes! If you plan to freeze the rhubarb sauce, chill it first, and then pack in freezer containers, allowing space for expansion, and freeze it quickly. Don't like the colour of your rhubarb? Do you want to make your greenish rhubarb into crimson red rhubarb? Besides a basic sauce recipe, rhubarb can be combined with different fruits to give it sensational flavour! It can be served with custard, crepes, or cheesecake. Or, you can spoon it over ice cream, pound cake, pancakes or waffles. The possibilities are endless, you will be sure to think of other ways to improve a dish by adding this amazing sauce!